Before you perform an abortion with self-administered Misoprostol pills, it is very important to stop the fetal growth. This part of pregnancy termination process is carried out by anti-progesterone medicines. Mifeprex and Mifepristone early abortion pills are known to be used first for this part. 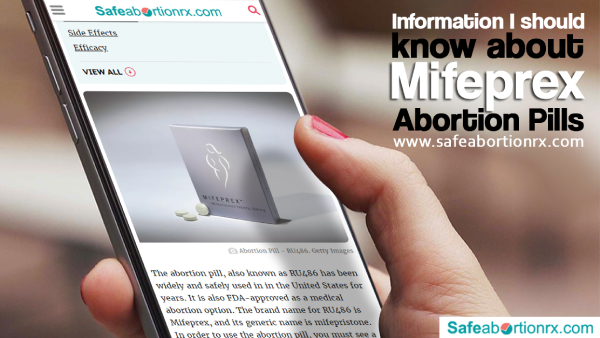 If you’ll look at the list of medical abortion Pills approved by the FDA in the USA, Mifeprex is one of them. Hence, most women have a safe abortion with pills like Mifeprex. What is Mifeprex and how can you get Mifeprex Pills online? Mifeprex is a pregnancy termination medicine which most medical experts suggest in the process of medical abortion. The pill stops the development of the pregnancy. Mifeprex pills are generally made available at an affordable cost. This abortion pill online can be taken at home along with the other pregnancy termination pills and end the pregnancy. There are not too many restrictions on women who are allowed to take Mifeprex. Following are the guidelines before buying Mifeprex abortion pill. Your an adult, meaning the age has crossed 18 years. You have taken a prescription from your physician and he is aware of your medical history/ condition before prescribing abortion pills. You state allows women to have early pregnancy termination. If you fall under the aforementioned category, you can buy abortion pills online for terminating an unintended pregnancy. You can also search for Mifeprex abortion pill in your nearby medical store. However, since there are fewer chances of finding abortion pills in local stores, online purchase option can best suit your pill requirements. Online Pharmacy Safeabortionrx is one of the best websites for women who wish to find pregnancy termination medication with safety. One pill of Mifeprex of 200 mg weight is effective enough to stop the pregnancy development of 9 weeks or lower pregnancy gestation. The Mifeprex pill consists of anti-progesterone constituents. These are anti-hormone components which work against the progesterone hormone. As a result, the fetal growth is stopped within 24 hours. 97% of women who take Mifeprex abortion pill while undergoing pregnancy termination procedure stop their pregnancy successfully. The side effects of Mifeprex are only a few such as continued symptoms of pregnancy, sickness, fever, fatigue, etc. After you consume the Misoprostol abortion pill, most side effects begin. They include vomiting, diarrhea, fever, chills, stomach pain, excessive blood loss, etc. These side effects may or may not occur with every individual. Also, they have temporary effects on the body since they get healed as the process ends. Do you receive any support for abortion pill consumption? The Mifeprex abortion pill is expected to be consumed orally with a glass of water. Though there’s no complexity in its consumption, women always look for support while administering abortion pills. Women with abortion support and Abortion service in Victoria, USA have reportedly told media and social websites that safeabortionrx.com has helped them in the process of medical termination of pregnancy. Women must note that Mifeprex abortion pill alone does not end an unwanted pregnancy. Misoprostol abortion pill is the one which eliminates pregnancy tissues from the body by making contractions in the uterine lining. The entire process can take up to a week or more to complete. You can confirm your pregnancy termination completion 2 weeks after the procedure.